Photo of the missing pyramid….Do you know where it is now? 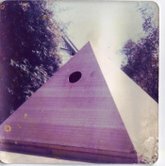 Here is the 33-year old picture of the mahogany pyramid taken in Yorba Linda, CA. Assembled over an 8-foot square plywood base, the triangular faces were all precision beveled to make clean invisible joints, as you can see. Front face tilted out on brass hinges mounted at the base. All other assembly hardware was custom made from 100% brass & copper, as I did not want any magnetic effects from steel or other ferromagnetic metals to be present. It was meant to be a meditation space, and for doing experiments with Pyramid energy. I had hoped that tests would be done to see how worms placed inside would be affected. Lost touch before doing any follow- ups on those questions. This entry was posted in Pyramids, Richard Ledford, Worm Farm. Bookmark the permalink.